In the year 2077, Earth has become a wasteland, ravaged by a war between humanity and alien invaders. The humans won, but the cost was immense. The devastation wrought on the environment as a result of the invaders' destruction of the moon and Earth's use of nuclear weapons forced most of the survivors to leave for a colony on one of the moons of Saturn. Jack Harper (Tom Cruise) is one of the few who remains as part of an operation to harvest the planet's remaining resources and send them to Titan. Jack is nearing the end of his contract, and while his partner Victoria (Andrea Riseborough) is excited about leaving, he has mixed feelings. He's plagued by dreams of a woman he's never met (Olga Kurylenko) and uncertain why the last surviving aliens, known as Scavs, continue to attack the remote drones and harvesting machines he maintains. What could it all mean, and how does his off-world commander, Sally (Melissa Leo) factor into everything? It would be easy to dismiss Oblivion as derivative, largely because it is. Visually, it borrows heavily from 2001: A Space Odyssey, Minority Report and WALL-E, to name a very select few, while thematically and narratively it tips its hat - and rather enthusiastically, at that - in the direction of Brazil, Blade Runner, Independence Day and the re-imagining of Battlestar Galactica. It's probably quicker to name popular works of science fiction that it hasn't borrowed from than the ones it has. However, it would be a mistake to criticise it solely because it owes a lot to other work, because every work of art does, unless it's been created by someone who has spent their entire life in the depths of the Rainforest, and even then they'll probably still end up ripping off Star Wars. 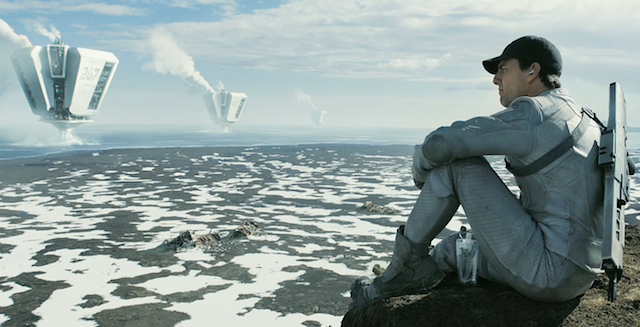 Even the films that it resembles like The Matrix and, especially, Duncan Jones' Moon are collections of styles, concepts and characters inspired by the work of other artists. Oblivion may be derivative, but so is all art. But one of the main problems with Oblivion is not that it wears its influences so clearly on its sleeve, but that it often seems to be little more than a list of them. It is possible to watch the film doing little else than count off the different films that it alludes to, or at least seems to allude to, because it often leaves little else of interest to focus on, particularly during its first half. The opening hour of the film is spent establishing the post-war Earth, the role Jack plays in maintaining the drones, as well as the nature of his character. Jack comes across as someone in a perpetual state of wonder, and while Victoria stays in the floating control centre that is their home, he enjoys traveling around, marveling at devastated landmarks, and spending time in a hidden valley of vegetation where he reads books that he finds whilst picking through the ashes of humanity. It's pretty effective as character development, especially in the way that it contrasts Jack's rough, inquisitiveness against Victoria's playful, yet firm dedication to their mission, but it moves about as quickly as molasses down a slight incline. There's nothing wrong with a film being slow, especially not a science fiction film, since it allows it to lay out and explore its themes, but Oblivion doesn't have any interest in exploring a particular theme. There are distant rumbles suggesting that it is about what it is to be human, the nature of the soul, and the resiliency of love and the human spirit, but those themes are so broadly drawn they might as well be spray-painted on a wall. Cruise and, especially, Riseborough do good work breathing life into those themes, putting a human face on a concept, but the script is so under-written - with the notable and painful exception of an opening scene of exposition-heavy voiceover which is about as graceful as a walrus on stilts (or a tortured metaphor) - there is only so much they can do. At times, it veers dangerously close to being Solaris without the ambition, or The Island with pretensions. Throughout its first half, Oblivion feels like a film champing at the bit to leave behind all this poetic, meditative stuff and get down to the important business of blowing stuff up real good, which is what it proves to be once a woman named Julia (Kurylenko) falls from the sky, Morgan Freeman and a horde of other humans appear, and Jack's world proves to be quite different from what he thought it was (though probably not all that different from what a halfway attentive viewer probably expected it to be). It's a film divided against itself; on the one hand, it seems to want to be a human story which has an air of mystery to it, while on the other it wants to be all about dogfights, pitched battles and a last-ditch attempt to save mankind. It is entirely possible for science fiction to be both, of course, but director Joseph Kosinski has made a film which feels like two wholly different stories, separated by tone, mood and intent, united only by a shared cast and aesthetic. Although, and this really cannot be stressed enough, that aesthetic is pretty wonderful to behold. Oblivion is, somewhat improbably, only Kosinski's second film after the equally stunning to look at (and similarly inert) Tron: Legacy and he is astonishingly assured for someone with relatively little experience making films on this scale, or any scale for that matter. Kosinski trained as an architect, and his education shows in the level of attention paid to composition, framing and design in both of his films, but which is especially beautiful in Oblivion. The home of Jack and Victoria is a wonderfully realised bit of modernist architecture, all glass, steel and sharp angles - think an upscale Hollywood star's home floating amongst the clouds - while the designs of all the ships and machines used throughout look like the sort of thing Stanley Kubrick and Steve Jobs would come up with if they had decided to design military hardware. The scenes of Jack traveling around the remains of New York are also brilliantly realised, particularly in the way they show the city as a place that has been destroyed, so much as submerged by earth and time. It's a seriously gorgeous looking film which even maintains its beauty during the action sequences, though it also doesn't sacrifice visceral excitement for visual perfection. This, ultimately, is where the film really shines. Once the plot kicks in at about the halfway points, its otherwise turgid pacing slips into overdrive as it becomes the film it wanted to be from the beginning; a big, crowd-pleasing blockbuster. It is still hampered somewhat by the sterility of its opening movement, particularly when it comes to deaths which should have a greater impact than they ultimately do, but it feels much freer in its second hour than its first, which is fairly appropriate given that the story is, in a sense, about someone freeing themselves from a previously intangible oppression. Oblivion is like a perfectly designed, immaculately arranged house, but for the first half it feels cold, empty, and uninhabited, desperately in need of being disrupted. It's only once people start to show up and cause a ruckus that it really comes to life.